If you want to get only profit without risk, then you should have sufficient amount in your account. There are different types of accounts(cent, micro, standard etc) with different leverages available with many brokers. So It is impossible to say a fix amount requirement with every type of account. That's why we have designed a tool, by which you can get the minimum recommended amount to use Aeron(Scalper+Grid) EA in your Forex-MT4 account. Following are the steps to install this tool. Now restart your MT4 terminal. 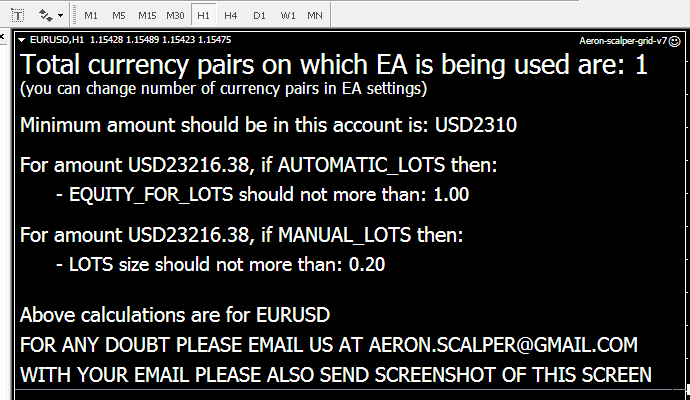 Now if you want to use EA only on one currency pair, then set Currency_Pairs=1. 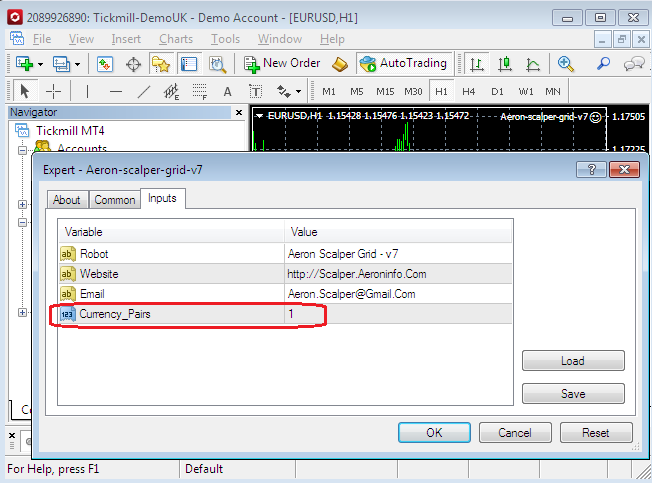 But if you want to use EA on 2 or more currency pairs simultaneously then set this parameter's value accordingly. 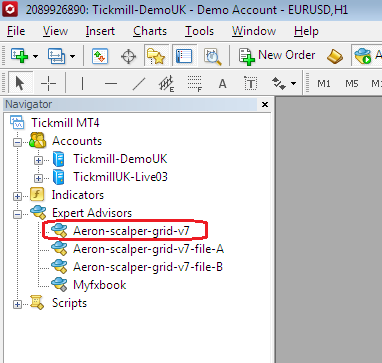 On the above screen you will get, minimum amount for Aeron(Scalper+grid) EA with recommened Lots size for safe trading. THESE ALL INFORMATION IS FOR SAFETY PURPOSE ONLY, IF YOU HAVE LESSER AMOUNT IN YOUR ACCOUNT OR SET BIGGER LOTS SIZE, THEN EA WILL ALSO WORK NORMALLY, BUT YOU SHOULD KEEP EYE ON YOUR ACCOUNT BALANCE AT LEAST ONCE IN 24 HOURS. SUPPOSE EA WARNS YOU FOR MINIMUM AMOUNT $2000, THEN YOU CAN USE EA ON $1000 ALSO, IT WON'T BE RISKY. BUT PLEASE DON'T GO BELOW 50% OF RECOMMENDATION. This EA can be used on little balance such as $100-$200 only, but for this you should have cent account. If you face any problem or doubt then please free to ask us at aeron.scalper@gmail.com or Click Here to fill our contact us form.